RSPB Fairburn Ings01977 628191work Nature ReserveLove nature and the outdoors? You’ll love RSPB Fairburn Ings. 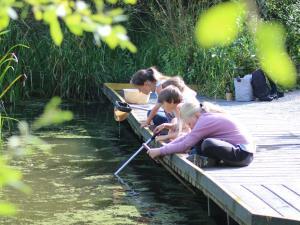 Try your hand at pond dipping, join in with exciting events or just have a relaxing stroll around the woodland. Fairburn Ings is the perfect place for the whole family to get closer to nature. Three main trails meander through woodland and grassland bringing you closer to birds and wildlife. Take a break from exploring the reserve and grab a warm drink from the Visitor Centre. Many of the trails are accessible to all. Dogs are welcome at the reserve and facilities including a dog parking area and a dog bowl are available on site. Please follow the countryside code while on the trails. Only assistance dogs can be brought into the Visitor Centre. The visitor centre, family trail and Lin Dike trail are accessible to wheelchairs and pushchairs. Lin Dike hide was highly commended in recent Natural Environmental Biffa awards and the site was awarded Quality Assured Status in 2007. Leave the A1 at junction 42 for the A63, and follow signs for Fairburn village on the A1246. Once in the village turn right at Wagon and Horses public house. At the T-junction turn right, and the reserve is 1.5 miles on the left.